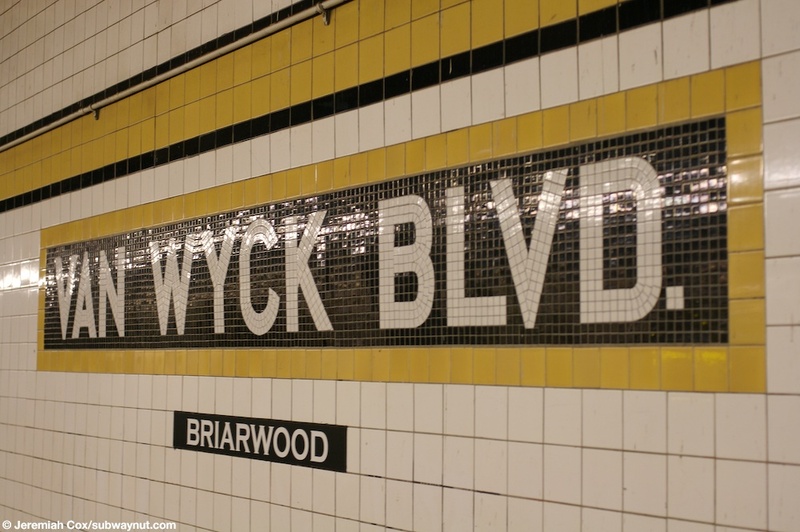 Van Wyck Blvd had the second name Briarwood for the surrounding neighborhood added to avoid confusion with the next stop Jamaica-Van Wyck on the E train's Archer Avenue extension that in opened 1988 with small tiles beneath each name tablet and column signs added. 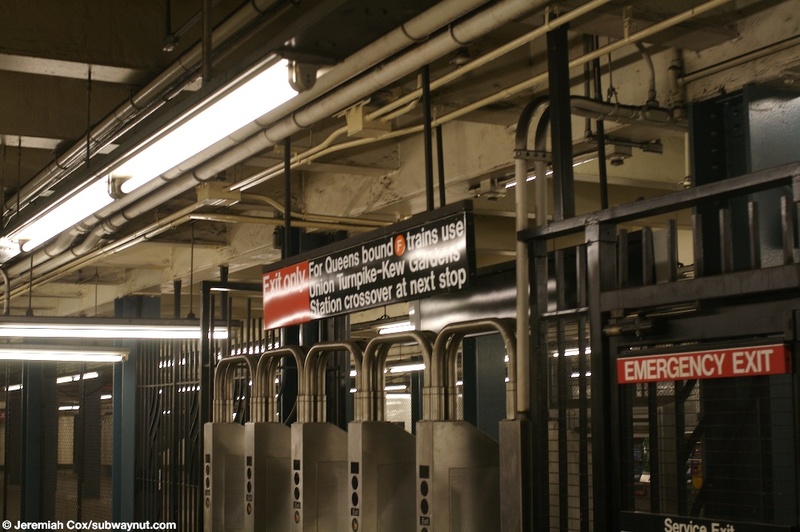 E only stop at the station during evenings, late nights and on weekends when the express tracks here are used for laying up trains and use a flying junction to reach the Archer Avenue extension just east (railroad north) of the station. 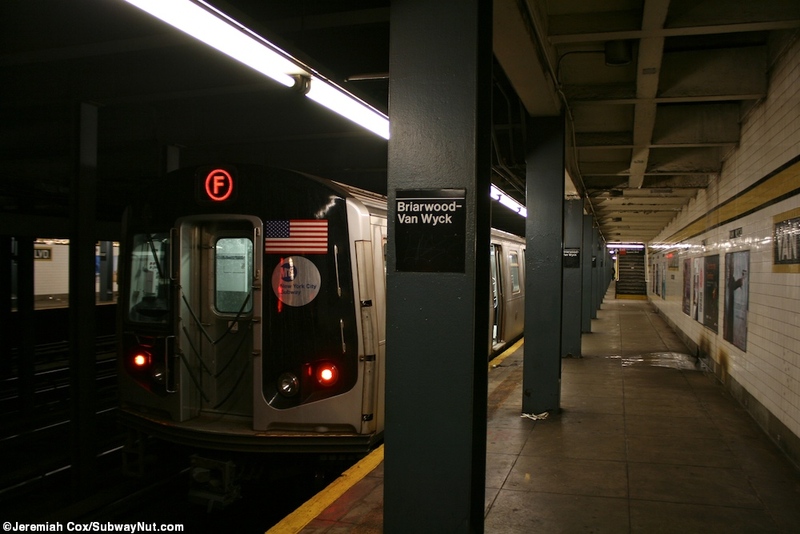 The actual street the stop is named for no longer exists in its original form; Van Wyck Blvd has been widened and turned into the Van Wyck Expressway complete with service roads on either side of the subway line. This makes leaving the station a bit of a disaster for commuters. In 2011 this is especially apparent today because of a major construction project going on that has closed off one of the underpass exits. A really amusing feature during this construction project is highway style railroad station signs (with the standard railroad station logo found at Amtrak stations all across the nation) with E and F bullets beneath directing people to the proper crosswalks to safely cross Queens Blvd and around go around the construction site on the Van Wyck. 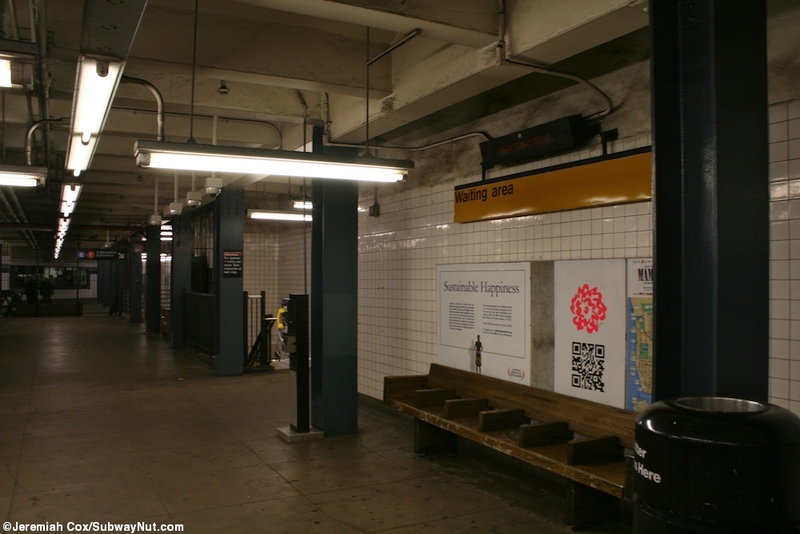 The station itself is like the rest here on the Queens Blvd line with two side platforms that lead up to a mezzanine that is much more modest and smaller than most of the other stations beneath Queens Blvd. The platforms have teal blue columns, with yellow borders over the white text on black name tablets, and yellow trim with a black border. The open portion mezzanine here is almost entirely outside of fare control, there is no free transfer between directions here, just about four staircases from each platform that lead to a bank of turnstiles that are mostly enclosed by a very ugly floor to ceiling chain link fence, the token booth is in between them, there are also a few higher turnstiles for the stations two exits. 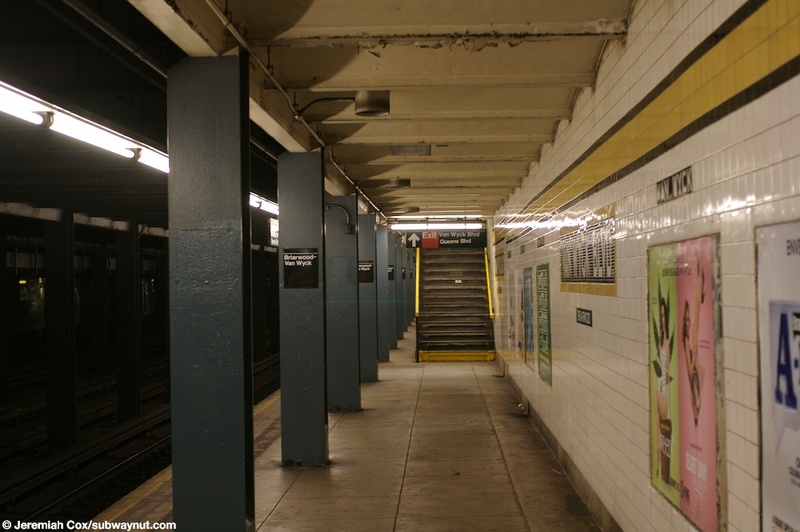 The one that leads directly up to the street, without an additional passageway, is towards the Eastern end of the station with a streetstair signed for "Van Wyck Service Road." This leads up to the western one right outside of Maple Grove Cemetery. This cemetery is the only landmark the exit really serves except for maybe a few houses just south of the cemetery (but these are also quite close to Jamaica-Van Wyck). 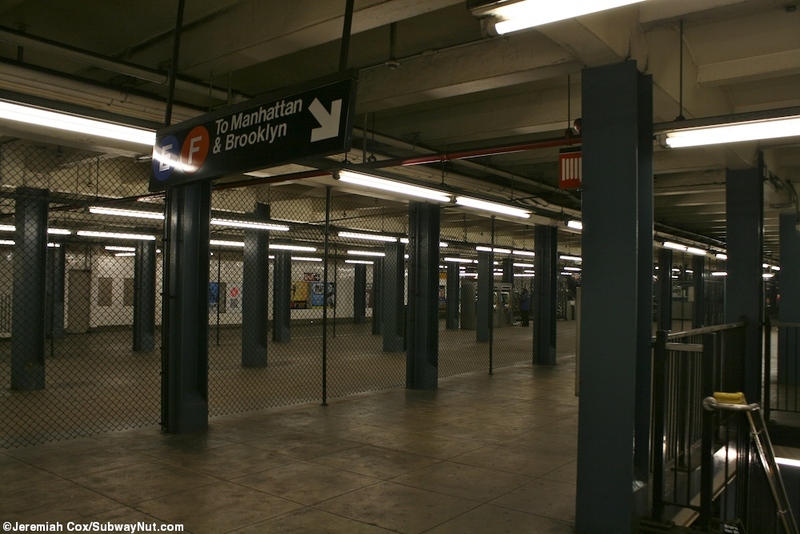 The more widely used and crowded exit at the western end of mezzanine consists of an underpass that curves away from the mezzanine and transit police station, it connects first to a street stair on the south side of Queens Blvd between Main Street and where Queens Blvd passes above the Van Wyck Expressway, the underpasses continuation to the northside is closed because of Van Wyck Expressway construction on the interchange that used to provide much more direct access to surrounding businesses. 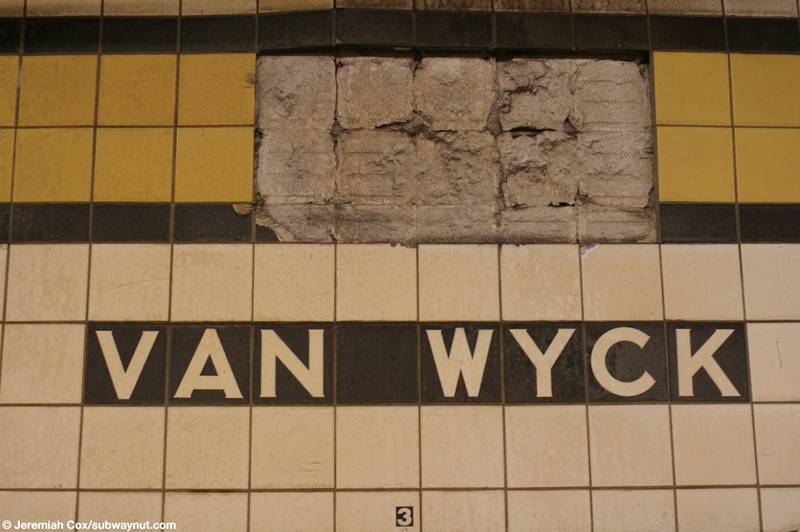 (vanwyckblvdf1) A name tablet for Van Wyck Blvd, with the Brairwood text applied directly beneath the tiling underneath it. 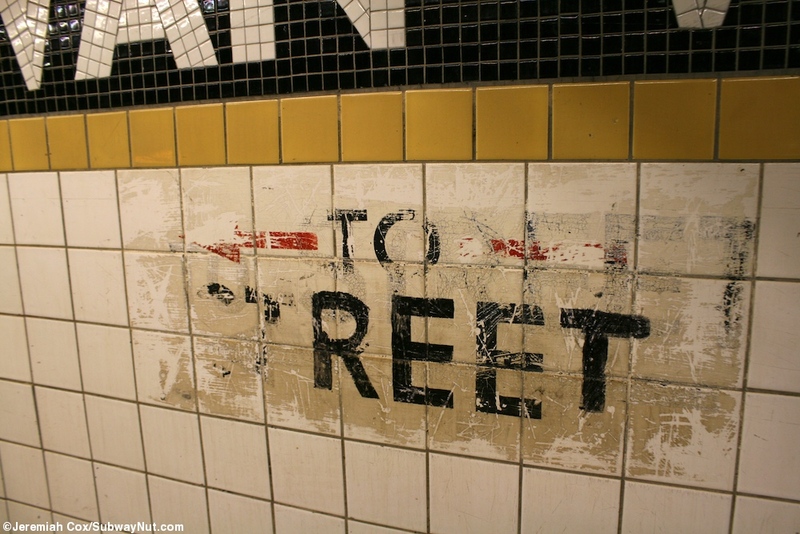 2 June, 2008 (vanwyckblvdf2) Van Wyck text underneath the trim at Van Wyck Blvd. 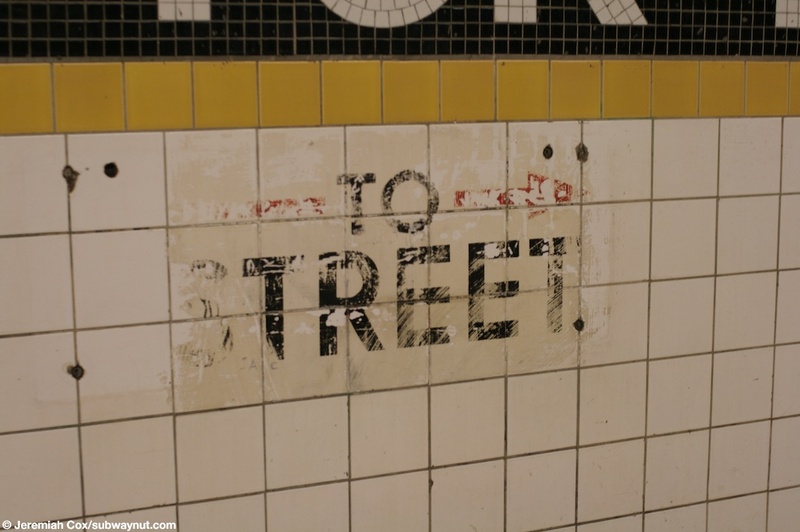 2 June, 2008 (vanwyckblvdf3) Original To Street paint underneath one of the name tablets at Van Wyck Blvd, the Brairwood sign hasn't been applied here. 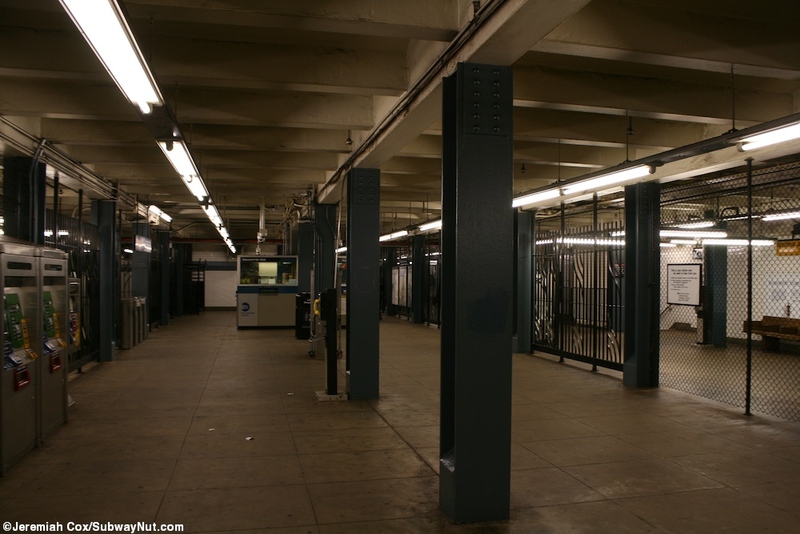 2 June, 2008 (vanwyckblvdf4) A view of the turnstiles in the small mezzanine area at Van Wyck Blvd for the Manhattan-bound platform. 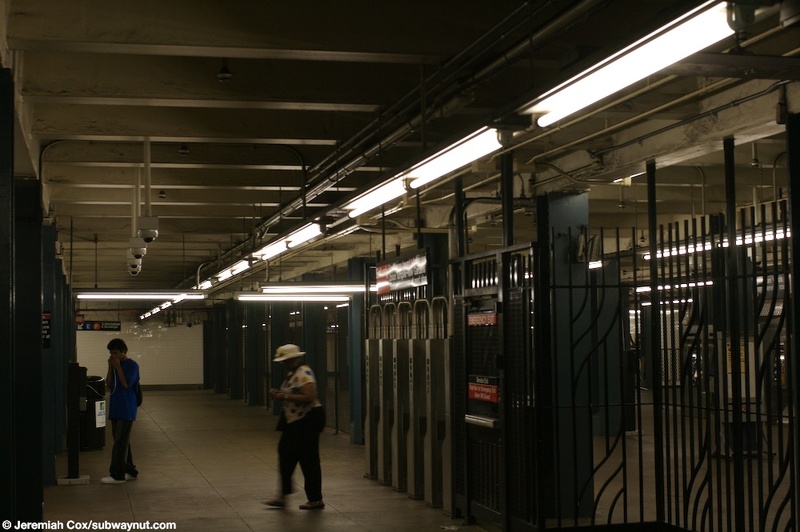 (vanwyckblvdf5) The turnstiles are exit only (obviously) a sign above them says to take the F one stop to Union Turnpike for a crossover. 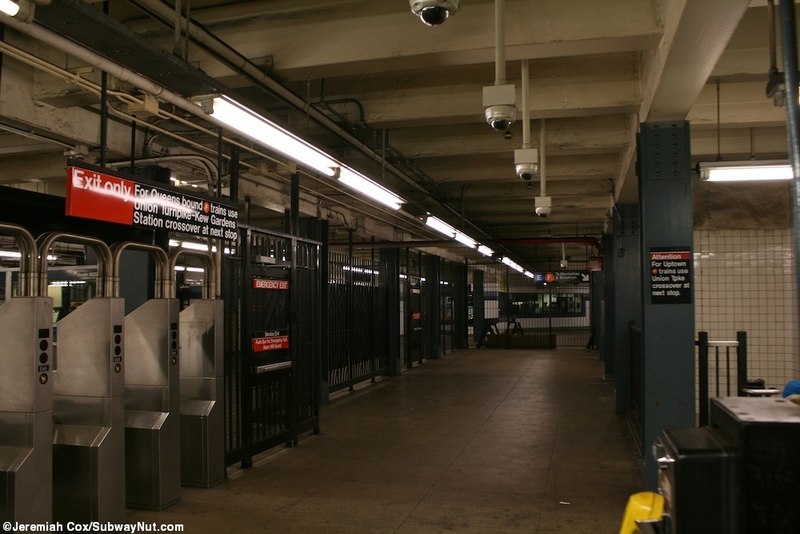 2 June, 2008 (vanwyckblvdf6) Looking through the very plane cheep looking chain link fence to the area outside of fare control at Van Wyck Blvd. 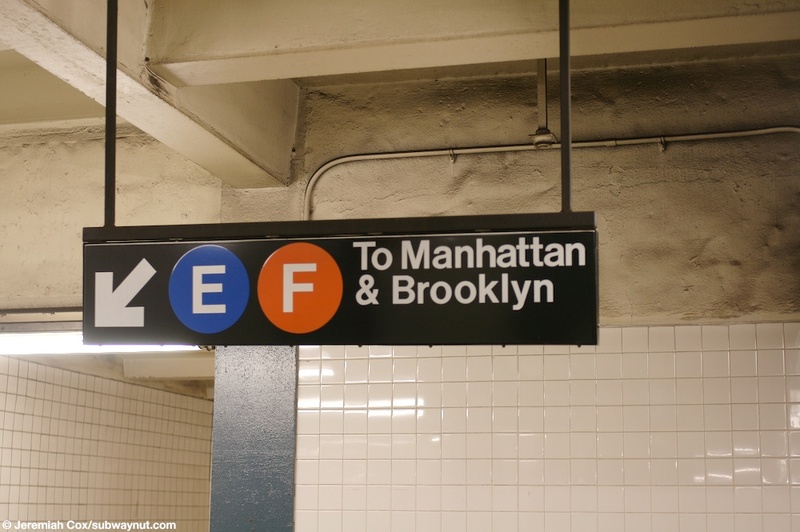 2 June, 2008 (vanwyckblvdf7) A sign for a staircase down to the E F To Manhattan & Brooklyn platform at Van Wyck Blvd. 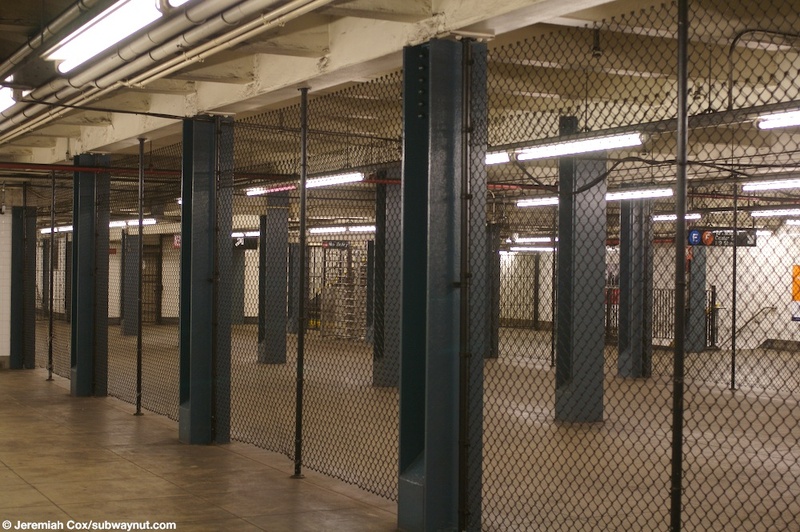 2 June, 2008 (vanwyckblvdf8) The portion of the Manhattan-bound mezzanine within fare control at Van Wyck Blvd, that is separated from the outside world by a cheep looking chain link fence is small by IND standards but cavernous by the standards of BMT/IRT stations. 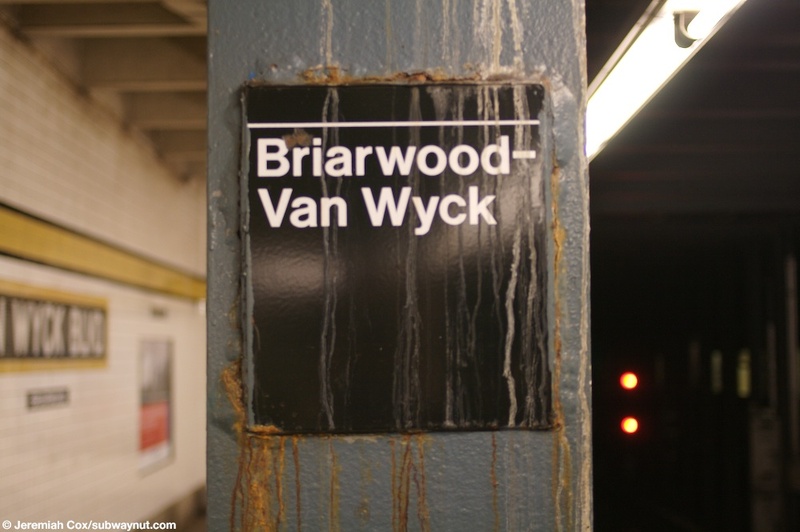 (vanwyckblvdf9) Some damage from a substance covers a column at Brairwood-Van Wyck. 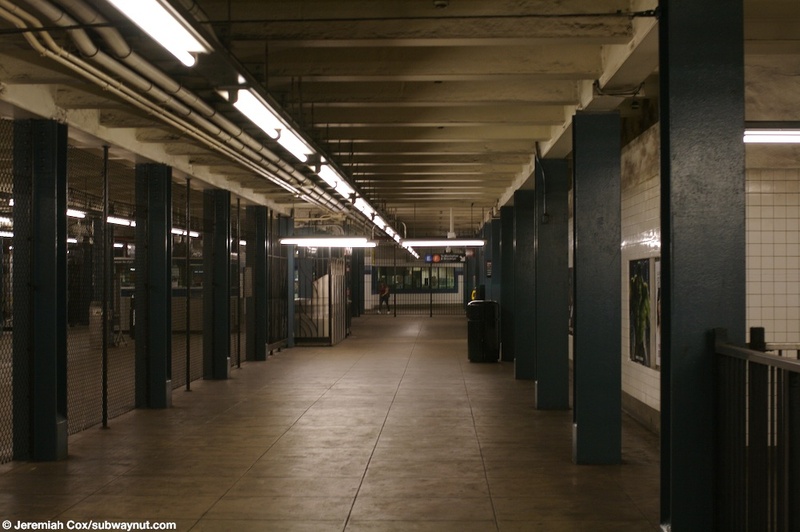 2 June, 2008 (vanwyckblvdf10) Looking down the platform at Brairwood-Van Wyck a staircase up to the mezzanine is visible.